Coming from Manila, where almost everything is cheap, prices of goods, services and admission tickets can be terribly shocking once you convert it to peso. Of course, they always say don’t convert else you won’t buy anything. Then again, there are plenty of inexpensive options around, specially here in [tag]Melbourne[/tag]. There are plenty of free activities around the city, from watching a trapeze company performing in the street to watching a concert at the Federation square. To help you get around, there’s the free City Cirle Tram and the free Tourist Shuttle bus, which takes you to (or within walking distance to) all of the major tourists attractions in the city. Admission to tourist attractions have fairly reasonable prices. Travelling with kids in Melbourne need not be expensive either. Ticket prices for kids are lower, sometimes they can even go in for free! Children under 4 years of age can also ride for free on the city train, trams and busses. The best time to watch a movie in Melbourne is on a Monday or Tuesday. During these days, cinemas have special discounted rates, almost 50% off the regular rate. Cinema Nova on Lygon Street, offers a whopping $5.50 per ticket, for all films showing before 4pm every Monday. You can also check out films at the [tag]Australia[/tag]n Centre for the Moving Image (ACMI), with tickets going between $5 and $10. Victoria Gardens Shopping Centre. If you’re a bookworm like me, there are literally hundreds of second hand and discount bookstores around the city. You just have to find one that offers the best price for your budget. As for eating out in Melbourne… well, that warrants its own entry. 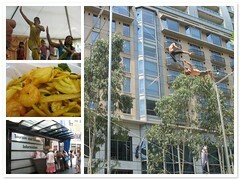 Melbourne is culturally diverse that you can be sure you’d be eating authentic cuisine of your choice whereever you go. If you ever find yourself in Melbourne wondering what to do, just refer to the brochures you picked up at the airport, or head on to the Tourist information center in the CBD (the biggest one is at Federation Square, just across Flinders street). The tourism agent would point you to the best places to go given the current weather condition, what you feel like doing and who you’d be doing it with. Ooooo…bookstores. Nice! That’s good to know they have an area practically dedicated to books. Also, where would you recommend shopping, if you’re on a budget? As for shopping for clothes, if you don’t mind second hand clothes, there’s a number of thrift stores around. My favorite is Savers in Footscray. I bought a gorgeous denim fur-lined coat for only $7.99! Aside from clothes, they also have shoes, furniture, toys, bags and you guessed it, books!